summerland is the musical identity of emerging, Oklahoma-based songwriter Nadia Piotrowsky. She weaves an Americana soundscape that reflects the road she’s travelled, from her Kansas City jazz upbringing to the beach pop of her former home in southern California to the red dirt roots of her current home in Stillwater. As the founder of monday@modella songwriter pop-up, Nadia has been sharpening her musical teeth this year, slowly carving a niche for herself in the Oklahoma scene. 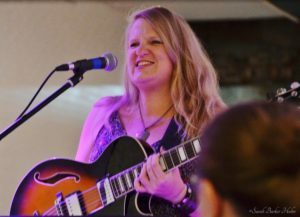 Recent honors include Honorable Mention in the 2017 Woody Guthrie Festival Songwriting Contest and invitations to join Gypsy Café 2018 and Women of WoodyFest 2018.